The mixture of ingredients improves moisture retention which will provide better germination than native soil. At the same time, the added fertilizer helps grass seedlings grow faster and stronger, leading to a thicker, greener lawn. At a depth of 2 inches 4 bags will cover 24 sq. ft. Prepare seeding or sodding area by removing dead grass and weeds and loosen top 0.25 inch of soil with rake. Place 1 inch of Scotts® Turfbuilder® Lawn Soil evenly over area. Spread grass seed and lightly rake into soil or lay sod over newly applied Scotts® Turfbuilder® Lawn Soil. Use when seeding, filling, or leveling lawn. 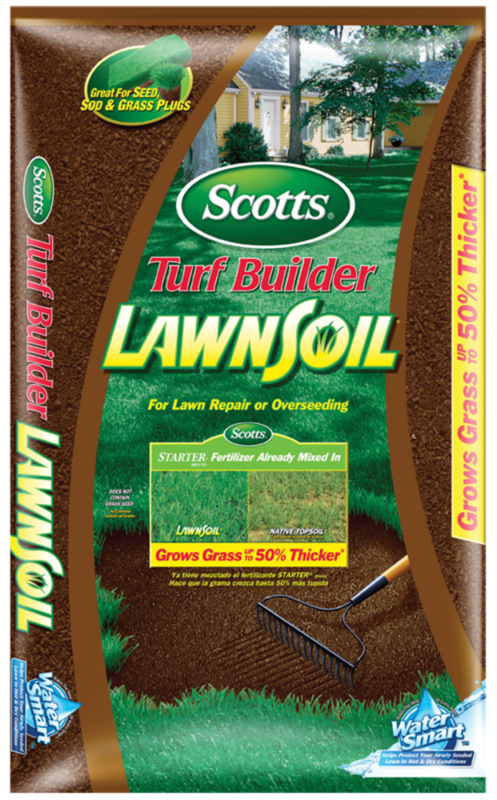 Disclaimer: *Tests prove Scotts® Turf Builder® LawnSoil™ grows grass up to 50% thicker compared to native topsoil. Great for sod and grass plugs. Keep out of reach of children. Do not ingest. Do not feed to animals. Do not apply near open water. Wash hands after use. We recommend wearing gardening gloves when using this product. Scotts most versatile mix, staying green even in extreme conditions of dense shade or scorching sun. Aggressively spreads to fill in bare spots.